Vikander truly embodies the new Lara Craft well and turns it into her own character. Back in the 1990s, a little game called Tomb Raider, featuring a female "Indiana Jones" type character named Lara Croft, was introduced to the world. To help the game's appeal to the mostly male gaming audience, she was created with a large bosom and also used two guns versus a whip. The game proved to be a smash hit and more video games were released. Then, in 2001, Hollywood came knocking and the first Tomb Raider movie was released starring Angelina Jolie. The film franchise went on to have a sequel with Jolie before it was retired. However, the gaming franchise was given new life around five years ago when another version of Lara Croft: Tomb Raider was released. The new game centered around a young Lara and showcased to the world that Lara was still a popular character. This resurgence, in turn, led to this year's reboot, simply titled Tomb Raider, starring Alicia Vikander (Ex-Machina) as the title character. Just like the reboot of the video game itself, the new film franchise centers around a younger Lara Croft - one that is not the experienced Tomb Raider that appears in the Angelina Jolie films. Her curves are also gone, giving way to a more realistic approach to the character as a hardened, tough girl trying to make it in the world with a missing father, Richard (Dominic West; Les Misérables), who is presumed dead. After learning that she must claim her inheritance before it is sold off, the young Croft is led to a secret chamber in her father's tomb which contains a pre-recorded message from him. Disobeying the message to destroy his research, Lara sets off on her own to investigate the circumstances of her father's death. Choosing to go with Vikander as the new Lara Croft was a great choice by Square Enix, Warner Bros., MGM, and director Roar Uthaug (The Wave). She truly embodies the "new" Croft that is more aligned with the current times than the buxom Tomb Raider of the past. She plays the part perfectly, showcasing skills Lara will eventually have as well as providing a three-dimensional character that was, unfortunately, lacking from its early incarnations. The same can unfortunately not be said about the story itself, as the world that Vikander's Croft lives in is still one-dimensional. Most scenes are not fully fleshed out, character motivation and actions are questionable, and the "in-game" set pieces used to give Easter eggs to gamers truly take the viewer out of the film and are unnecessary. Mastered from a 4K source as well as given the HDR10 and Dolby Vision treatment, the new Tomb Raider film looks amazing on 4k UHD. Jungle colors are lush and bright and the sharpness and detail shown throughout the film truly show off the benefits of the new 4K platform. 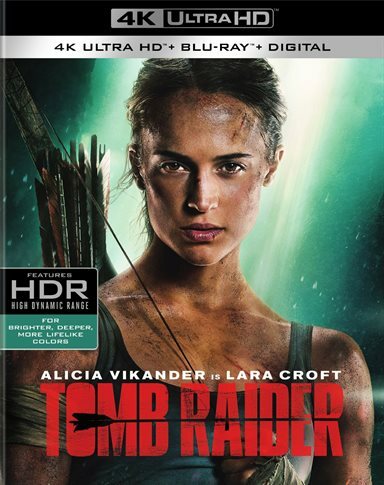 Tomb Raider 4K provides the viewer with a very powerful Dolby Atmos track that has great clarity and wide sound. All the sounds and wonder of Lara's world envelope the person's viewing area. This, combined with the high-quality video, makes the viewer feel like they are truly there in the jungle with her. All the special features for this combo pack can be found on the Blu-ray disc included. Unfortunately, there aren't too many of them and they all seem to be fluff pieces. Tomb Raider: Uncovered - This feature shows the cast and crew discussing some of the challenges of making the film. Croft Training - See what it took to get Alicia Vikander into the peak physical shape needed for this physical performance. Breaking Down the Rapids - The director discusses this action scene from the film. Lara Croft: Evolution of an Icon - In this extra, the history of the character and franchise is explored - from video games to the films. Also included is a Digital HD copy of the film. However, going against the current, this version does not include a Movies Anywhere version and only an Ultraviolet version of the film. This is possible because of its co-production with MGM. Lara Croft and Tomb Raider have a popular following and it is great to see a reboot of the series. Vikander truly embodies the new Lara Craft well and turns it into her own character. Unfortunately, the rest of the film was just a "by-the-numbers" action piece. Hopefully, her next outing will have a story and supporting cast that backs up Vikander's fantastic performance. However, until then, we have an amazing looking 4k transfer that is truly demo quality. Download Tomb Raider from the iTunes Store in Digial HD. For more information about Tomb Raider visit the FlickDirect Movie Database.